Guatemala, the most diverse tourist destination of Central America, has been enticing travelers for centuries. Considered the Mayan heart of Central America, this beautiful country offers a lot more than the Mayan wonders though. Guatemala probably has the most tightly packed must do things and must visit sights than anywhere in Central America. From archeological wonders of Mayan ruins to colonial towns, pristine jungles, endless hiking trails and ancient culture – there are simply a ton of things for you to do when you travel to Guatemala. To help plan your tour and avoid the crowd that is slowly discovering this beautiful country, here are the top four things which you must try out when you travel to Guatemala. The Tikal National Park is the most famous cultural and natural tourist attraction of Guatemala. Built around the largest excavated Mayan site of Guatemala, the Tikal ruins will give you a sense of adventure like no other. Visit the park early and stroll through the empty ruins, and find yourself lost in the wondrous structures of a long-lost era. The Yaxha Mayan Ruins are much more secluded than the Tikal Ruins. Hike the serene trail through the jungle before reaching the beautiful Mayan complexes. These ruins are smaller when compared to Tikal, but they are much less commercialized and less crowded. You can spend your time looking at the marvelous structures, the ancient drawings, and the carved symbols. If you are interested in Mayan history and culture, visiting this site is a must when you travel to Guatemala. The Pacaya volcano is one of the most accessible volcanos in Guatemala, which makes it one of the most popular destination. The volcano is still active, which makes the hike to the top of this volcano a must-do activity when you travel to Guatemala. You can hike the steep trail to the top of the volcano in about one and a half hour, and you can indeed roast some marshmallows in the heat which gets eliminated from the ground of the summit. 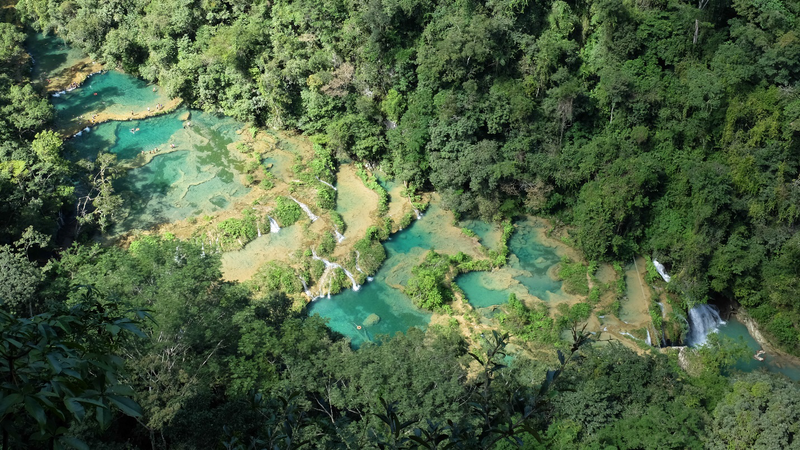 Located near the little town of Lanquin, Semuc Champey is one of the most beautiful natural wonders of Guatemala. You have to travel deep into the jungle to come face to face with this massive natural limestone formation. The formation is covering an underground river, which forms a number of stepped swimming pools. There are a lot of hiking trails, lookout points and guided tours in this area. Apart from all of these, there are many tours to the Kan’Ba caves as well. There you can swim along an underground river. The place is so dark that you will have to hold a candle above your head to light your way as you swim. Visiting here is another one of the must to activities when you travel to Guatemala.